The request for Environmental Protection Agency (EPA) Administrator Lisa Jackson to waive the Renewable Fuel Standard (RFS) mandate is gaining even more traction across the country, with Gov. Rick Perry (R-Texas) announcing that his state is joining the coalition. Texas joins more than 180 members of Congress, the governors of Arkansas, Delaware, Georgia, Maryland, New Mexico and North Carolina, the National Cattlemen’s Beef Association (NCBA) and other livestock groups in requesting that relief from high corn prices be brought to the thousands of producers who are struggling to feed their animals amid the worst drought in roughly 50 years. Under the RFS requirements, 13.2 billion gallons of corn-based ethanol must be produced in 2012 and 13.8 billion gallons in 2013, amounts that will use about 40 percent of the nation’s corn crop. Due to this year’s crippling drought, some agricultural forecasters now are estimating that just 11.8 billion bushels of corn will be harvested this year, meaning corn-ethanol production will use about four of every 10 bushels. As of August 2012, more than 70 percent of cattle country was reported by the U.S. Department of Agriculture to be in drought conditions. The center of the drought is in the Midwest and southern Great Plains, where months of record breaking heat starting in March and below average spring precipitation helped create the now record drought conditions. Much of the country’s crop production has been hindered by the drought, and crop prices are reaching near all-time highs. Jim Peters, Chairman of the Texas Cattle Feeders Association (TCFA) said the organization appreciates Gov. 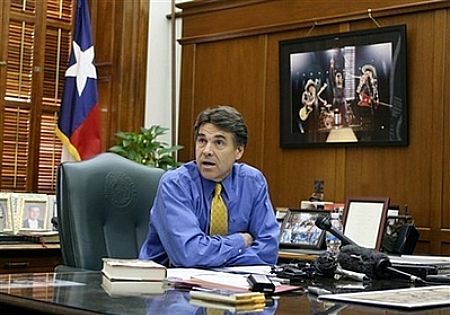 Perry’s support and leadership on this issue.